Malware Destroyer is an uniq malware removal utility with new and fast featured scanning engine! Malware Destroyer is an uniq Malware removal utility with new and fast featured scanning engine! it only takes about ~10. seconds to scan the whole computer for over 7500 real targeting definitions. The current version supports most types of Malware's like, adware, trojans,worms,spyware and dialers. Proactive anti-malware program to clean and protect your PC from all internet threats: viruses, spyware, Trojans, bots, adware and worms. Uses 3 layers of protection: surf protection, file guard and behavior blocker. ByteFence Anti-malware's cutting edge software detects and removes Trojans, Worms, Spyware, Crapware and other high risk malware. Atelier Web Firewall Tester is a tool for probing Personal Firewall software strengths against outbond attempts from network trojan horses and other Malware or spyware. This will help you tweak your existing Personal Firewall software for improved protection or make a rational choice of a PF within the available alternatives in the market-place. What is protecting your system while you are waiting for a security update? AbuseShield picks up where the anti-virus and firewall software fail, proactively shielding your system from malware before they harm your system. A program for secure file deletion and disk wipe which destroys (by overwriting) data in multiple files and multiple folders on floppy, ZIP or hard disk so that the data cannot be recovered. Single-file or batch-mode operation. Dupe Destroyer 5.2 removes duplicate entries from one or more wordlists very quick. These lists could contain passwords, E-Mail addresses, words from a dictionary, etc... All lists are processed in RAM, which causes a processing that is very fast. Signature-less, zero hour protection from known or new malware and intrusions for Windows desktops and servers. DSA continuously evaluates system processes, applications, registry and other variables to block potential threats. 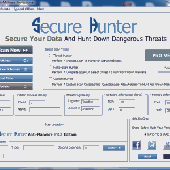 Malware Scanner is an Adware, , Key Loggers, Dialers, Hijackers Trojans,thiefware removal utility, Also removes Bundled spyware components from Kazza, Morpheus, audiogalaxy, and many other spywares. Host Based Intrusion Prevention System. Real-time proactive protection against known and unknown malware and rootkits. 100% freeware.